The Formative Assessment Lesson is designed to be part of an instructional unit. The tasks should be implemented approximately two-thirds of the way through the instructional unit. The results of the tasks should then be used to inform the instruction that will take place for the remainder of the unit. These lessons are Alpha versions created by Kentucky Department of Education Mathematics Specialists and field tested by Kentucky teachers. If you encounter errors or would like to make suggestions, please use the contact form below. Click on the picture below to access the lessons from the Kentucky Department of Education website. ﻿Concept Focused FALs The lessons below have been revised to include a whole class introduction and other edits. This lesson is intended to help you assess how well students are able to decompose numbers less than or equal to 10 into pairs in more than one way. It will help you to identify students who have difficulty anchoring to 5 and 10, identifing different representations of a number sentence, one- to-one correspondence, structuring numbers, and/or addition. 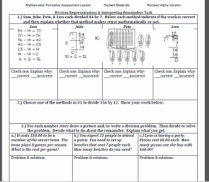 This lesson involves mathematical content in the standards from across the grade, with emphasis on Operations and Algebraic Thinking K.OA:Understanding addition as putting together and adding to, and understanding subtraction as taking apart and taking from.This lesson involves a range of Standards for Mathematical Practice, with emphasis on: 2. Reason abstractly and quantitatively. 7. Look for and make use of structure. 8. Look for and express regularity in repeated reasoning. Recognizing patterns on the hundred chart. Grade 2 - Place Value What's the Value of Place? Recognizing place value of ones, tens, hundreds. Use correct mathematical vocabulary to explain place value to a partner. Make connections of place value to previously taught lessons. 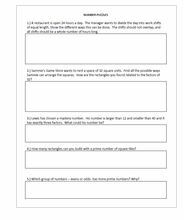 ARROW CARDS - This lesson needs arrow cards for students to manipulate. Click HERE. MP.3. Construct viable arguments and critique the reasoning of others. into b equal parts: understand a fraction a/b as the quantity formed by a parts of 1/b. 3.NF.2a.b. Understand a fraction as a number on the number line; represent fractions on a number line diagram. 3. NF.3 Explain equivalence of fractions in special cases, and compare fractions by reasoning about their size. composites. understanding the difference between factors and multiples. This lesson involves mathematical content in the standards from across the grade, with emphasis on: Operations and Algebraic Thinking 4.OA Gain familiarity with factors and multiples. This lesson involves a range of mathematical practices from the standards, with emphasis on: 1. Make sense of problems and persevere in solving them. 2. Reason abstractly and quantitatively. 6. Attend to recision. 7. Look for and make use of structure. with emphasis on: Make sense of problems and persevere in solving them. 4.G.2 Classify two-dimensional figures based on the presence or absence of parallel or perpendicular lines, or the presence or absence of angles of a specified size. Recognize right triangles as a category, and identify right triangles. 4.G.3 Recognize a line of symmetry for a two-dimensional figure as a line across the figure such that the figure can be folded along the line into matching parts. Identify line-symmetric figures and draw lines of symmetry. including the CCSS Number and Operations 5.NF Use equivalent fractions as a strategy to add and subtract fractions. This lesson involves a range of Standards for Mathematical Practice, with emphasis on: 1. Make sense of problems and persevere in solving them. 3. Construct viable arguments and critique the reasoning of others. This concept-based lesson is intended to help you assess how well students understand the result of multiplying and dividing less than and greater than one and what strategies they use to perform these operations. 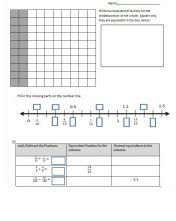 It will help you to identify students who have difficulty with conceptual understanding of the properties of numbers, not seeing the relationship between multiplication and division, and applying efficient strategies to multiply and divide with decimals to hundredths. This lesson is intended to help you assess how well students are able to model three dimensional figures and find their volume. In particular, this unit aims to identify and help students who have difficulties with: Recognizing volume as an attribute of three-dimensional space. Measuring volume by finding the total number of same-size units of volume required to fill the space without gaps or overlaps. Measuring necessary attributes of shapes, in particular the base area, in order to determine volumes to solve real world and mathematical problems. Geometric measurement: understand concepts of volume and relate volume to multiplication and to addition. 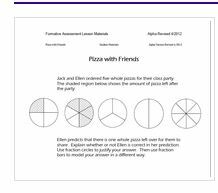 This lesson involves a range of Standards for Mathematical Practice with emphasis on: 1. Make sense of problems and persevere in solving them. 4. Model with mathematics. 7. Look for and make use of structure. Students may enter this problem solving task in a multiple of ways. There is student work included for students to anayze as part of the learning process. This problem solving lesson is intended to help you assess how well students are able to identify patterns (both linear and exponential) in a realistic context: the number of beads of different colors that are hidden behind the cloud. In particular, this problem solving lesson aims to identify and help students who have difficulties with: Choosing an appropriate, systematic way to collect and organize data. Examining the data and looking for patterns. Describing and explaining findings clearly and effectively. Grade 4-6 Fractions: Where are the Cookies? understandings of operations on whole numbers. 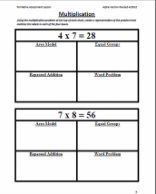 5.NF Apply and extend previous understandings of multiplication and division to multiply and divide fractions. 6.NS Apply and extend previous understandings of multiplication and division. Click here for a complete list of Formative Assessment Lessons and descriptions K-12.